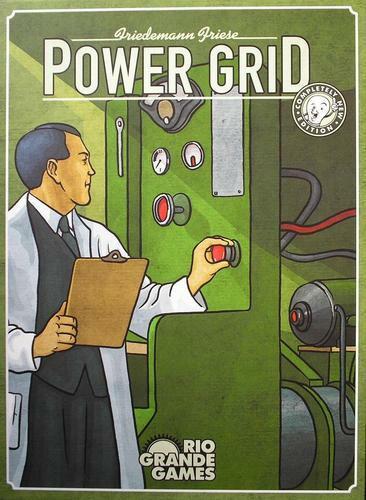 Power Grid is a simple, business game for two to six players, in which participants compete to buy power plants, the fuels to run them, and then build networks to sell their generated electricity over. In turn, the profits from electricity sales are used to build newer, improved plants, supplying more electricity, stockpile resources, earning greater profits, with a winner eventually determined on who supplies the most consumers. The gaming elements are simple enough that the rule booklet, which is clearly written, can be read through and understood virtually in its entirety immediately before play. Each turn of the game runs through four phases. Firstly, power plants are bought at auction, each player proffering an available plant in turn, with the plant going to the highest bidder. Purchased plants are replaced from a visible ‘futures market’, allowing players to plan ahead with their bids. The second stage involves buying raw materials from the market. Each plant produces energy from one of five sources: coal, oil, garbage, nuclear or renewable. The latter plants require no raw materials at all and are oft hardest fought over at auction. The other fuels become increasingly expensive as supply dwindles, forcing players to either diversify their sources, or stockpile for future shortages. The third phase has players building an electricity network to supply power to their consumers. The network costs are based on proximity, and as players can only initially build in unoccupied cities, good initial placement can be a crucial factor. The final phase of the game is called the ‘bureaucracy’ phase, dealing with the supply of electricity (and thus generating profits), and various bits of setup to keep the game flowing. Far and away the most crucial and successful element in the game’s mechanics is the turn order. Players in a leading position are essentially penalised in every phase of the game, enabling players who are lagging behind to catch up. Going first means having more competition during the power plant auction phase (since you may only buy one power plant each round, other players may bid on your choice, but you may not bid on theirs), and then the turn order is reversed for the following two phases, meaning buying raw materials last (generally more expensive) and building the electricity network last (also potentially more expensive). A final ‘cap’ on players’ advance is the increasingly poor return on electricity sales, the more consumers are supplied, so that the player with the network twice as large as anyone else may only receive an extra sixty percent of earnings over the others if he is able to power it all. Of course, this turn order isn’t decided by human invention but by the game’s mechanics, meaning that it can (and should) be manipulated by the players to avoid having to be in pole position. Turn order is determined by the size of a player’s network, and thereafter on who has the highest rated power plant in the event of a tie, and players often end up deliberately underdeveloping in order to stay their hand until a later stage in the game. Whilst some might decry the unrealistic way in which this serves to level the playing field a bit, it does mean that players cannot turn an early advantage into a runaway success quite so easily, simultaneously adding an extra tactical element to the game. Although playable with a minimum of just two players, Power Grid really benefits from bringing extra players to the table. 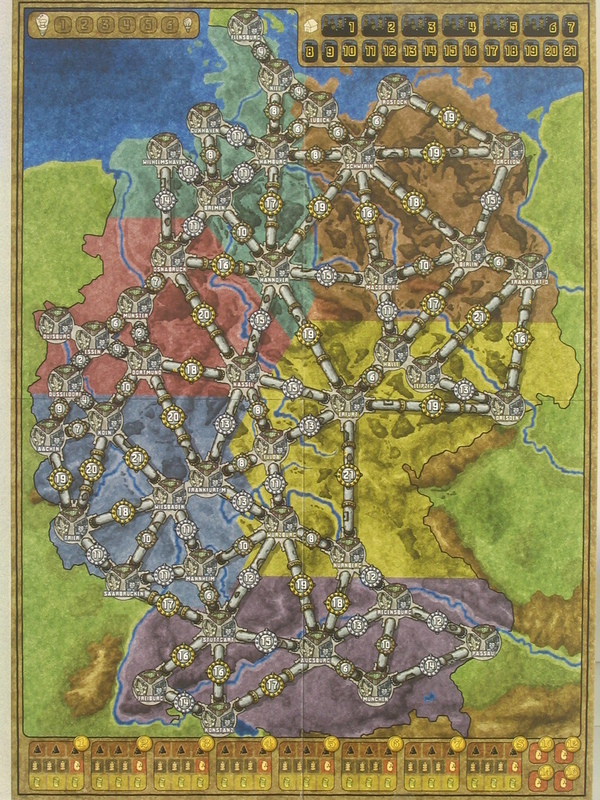 The game comes with a double-sided playing board, with a map of Germany and the USA on either side, with each country being split into regions, with the number of adjoining regions played over corresponding to the number of players. Furthermore, the resources are restocked at a rate relative to the number of players taking part, and other restrictions are made on the power plants market with fewer players present. In these ways, the game attempts to increase competition for games with few players, but these measures cannot hope to replace the competition that can be provided by thinking players. With just two players, every city is open to be built in, there is more chance that specific resources can be monopolised, and the competition in the power plant market is largely negated. With six players, cities can easily be blocked (a maximum of three players can supply electricity to a city, and that only at the latest stage of the game), resources monopolised, power plant competition becomes more vocal, and in general the game becomes much more involving and less like a game of multiplayer patience. Nevertheless, the game isn’t to everyone’s liking, and isn’t too forgiving on beginners. The rules which allow players doing badly to catch up can often times be manipulated, to such an extent that a player gaining a reasonably early lead who can then artificially maintain a low position will go on to win the game later as long as he times his move right. The key element to the game is the auction stage, which relies on players being aware of what power plants are potentially available, as well as calculating their paper worth against the available resources. Whilst this is a strong central characteristic, it relies on players being able (and willing) to keep track of their finances, and can often be the cause of many a headache, as those carefully laid plans are altered by another player sending the price of coal up. Furthermore, as this isn’t an elimination game, players who make an early mistake and find themselves beyond the game’s built-in rescue mechanisms will end up going through the motions in last place till the game’s conclusion, entirely unable to make up for their earlier mistakes. Whilst not so common when players have a few games under their belt, this unforgiving element can easily put beginners off playing the game again. Overall then, Power Grid offers a decent business game that has enough elements to keep the game quite tactical even after several plays. The mechanisms in place to ensure the leading player doesn’t run away with it, and the collateral ability of players to manipulate this element, work quite nicely, with the whole ruleset in general feels quite tight and well tested. Unfortunately, that does leave the game to be quite precise on the financial side, forcing players to continually plan ahead and keep up the arithmetic to ensure they’re getting the best deals and still have enough money left over to do all they wanted to. With a smaller number of players, the game doesn’t force enough competition between the players, and players are unable to directly impact on others (particularly not without detriment to themselves) leaving the game all too often a foregone conclusion well before the end. With more players, the competition increases in a number of areas, and gives players behind in the rankings a chance to at least retard the big players between them. Nevertheless, the final result very rarely comes as a surprise, and in my experience the game always ends on something of a low ebb, checking to see that the player expected to win actually did, with the peak in excitement coming somewhere in the middle. And given the unforgiving nature of the game for beginners, this isn’t one that works well when integrating new and experienced players.